12V DC UPS and battery back-up (BBU) for Cars and Automobiles, Uninterruptible power supply controllers for cars 5 amp throughput with LED annunciation, made in USA, NAFTA eligible, auto UPS. 12 volt DC UPS module keeps 12 volt equipment alive in cars and taxis using an external sealed lead acid battery, acting as a battery back-up (BBU). Can drive LEDs to show what the status is. 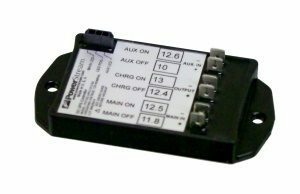 Click here for the 12 amp DC UPS controller. We have several models of the DC/DC auto UPS control module. This one works in 12 volt systems, has a throughput of 5 amps and has the ability to drive LEDs or relays to indicate the status of the UPS. This is a microprocessor controlled uninterruptible power supply control module. You can connect the module to the car's electrical bus and it will charge an external 12 volt lead acid battery of your choice. Your equipment, for example, a small computer, video recorder, or a car alarm, is connected to the module. This equipment runs off the automobile's electrical bus until the voltage from the car drops below a preset voltage, the "N" voltage (from 13.1 to 11.9 volts, depending on your needs). Then the external battery takes over. When the external battery drops below the "P" preset voltage (Between 10 volts and 3 volts depending on your requirements) the power is cut off to either prevent damage to the external battery or to run your equipment as long as possible. These controllers can charge an auxiliary battery from the car's alternator system. The auxiliary battery is isolated from the car's electrical system so that it will only operate the equipment attached to the load terminals of the controller. The load terminals power your equipment from either the car or the auxiliary battery, acting as a battery backup (BBU). The switch position depends on the voltage levels of the two inputs. This allows your equipment to be powered from the car when car power is available. 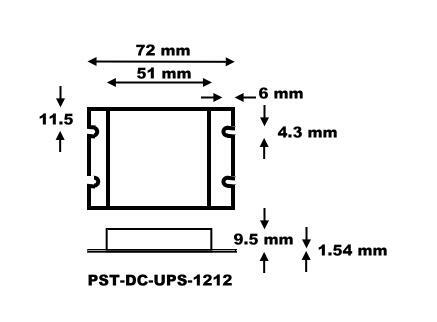 The DC UPS controller protects the auxiliary battery from being over-discharged. The control set-points of the DC UPS controller can be set so that the equipment switches to auxiliary power when the car is shut off. The setpoints can also be set so the the crossover voltage is lower, say 12.0 volts. This allows the load to run off the car's battery but cut off while the car's starting battery still has enough power to safely start the engine. One of the most popular applications is to run a small auxiliary battery that kicks in while the car is starting to prevent equipment drop-outs when the car's voltage sags. Status Connectors The connector on the UPS module is a MOLEX 43650-0316. 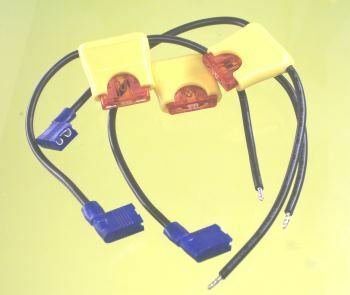 The customer supplied mating connector shell is a MOLEX # 43645-0300. You also need three socket contacts to insert into the shell. These are MOLEX # 43030-0009. Status Pinout PIN 1. Negative side of the MAIN LED. This pin will be low when load is being powered from the main input. Maximum sink current is 30mA. PIN 2. Positive supply for the LEDs. Nominal output 12VDC. Do not draw more than 30mA from this pin. 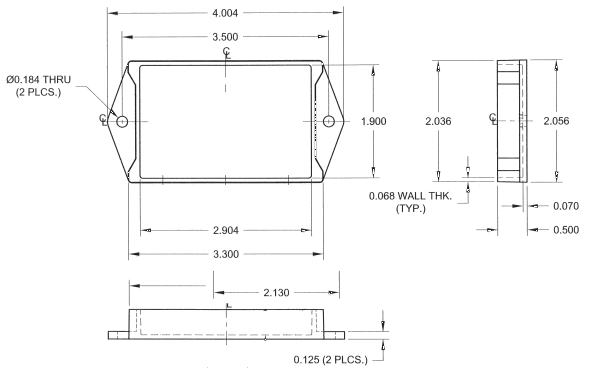 Current limiting resistors will be needed in series with the LEDs. PIN 3. Negative side of the STANDBY LED. This pin will be low when load is being powered from the standby input. Maximum sink current is 30mA. 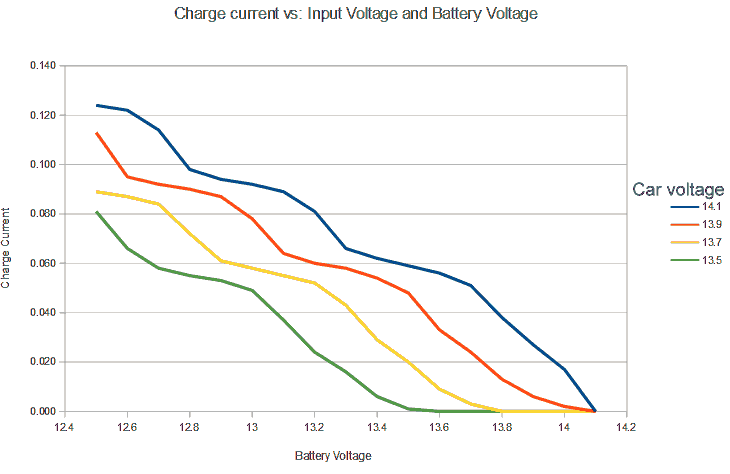 P8 8 volts When longest possible system operation is desired regardless of loss of auxiliary battery cycle life. In-line fuse kit, consists of 2 in-line automotive spade fuse holders for the battery+ and load+ lines. Includes 7.5 amp fuses. The charge current depends on both the car voltage and the state of charge of the battery. When the car is running the blue curve applies. 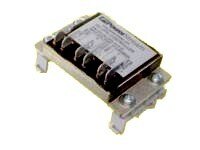 A: We have developed a new module with power up to 120 watts. Click here for details . A: Consider the 24 volt version of the 10 Amp backup module which will use 24 volt auxiliary batteries in a 24 volt vehicle.